The Boston Celtics were a vastly different team when they entered the 2010s, but the Paul Pierce, Kevin Garnett, Ray Allen, and Rajon Rondo led unit were still the favorites to win the eastern conference. Now, after a momentary lapse of fervor and a gradual rise back atop the proverbial hill, Brad Stevens’ new-age Celtics entered the season as the darling of the eastern conference. The symmetry is unimaginable, and a testament to both Danny Ainge’s brilliance and Celtics fans opulence. Forecasts aside, the Celtics have yet to lend credence to the predictions—outside of their debut against the Sixers. While 50,000 issues may be an exaggeration, the Celtics certainly have demonstrated a plethora of concerns worth addressing—from practically their entire primary rotation. The elephant in TD Garden is Gordon Hayward, whose struggles have already been well documented. It’s no secret that Hayward is a shell of his former self. Granted, it shouldn’t be a surprise either. Hayward still seems reluctant to weather impact around the rim, his jump shot has faltered, and he appears hesitant to explode in acute motions. But, considering the nature of his gruesome injury just one year ago, this shouldn’t come as a surprise to anyone. The problem lies in Stevens’ overt attempts to ingratiate him into the Celtics schemes, without considering the ramifications of his shortcomings. Stevens and Hayward’s relationship is well documented and was more than likely the sole factor in Hayward choosing the Celtics. However, playing the $30 million man nearly 26 minutes per game is damaging. The obvious reason would be due to a lack of production—with Hayward only scoring 10 points on 40 percent shooting from the field. The second issue, that’s quite possibly even more damaging, is the hole in the rotation that he fills. While Hayward has averaged 26 minutes per game, he has also started 15 of his 19 games this year. 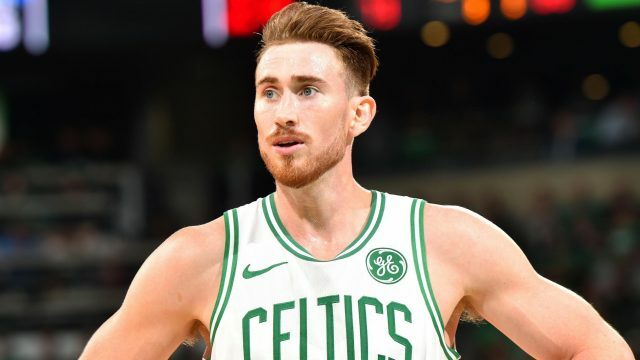 Hayward has graciously opted to defer in his role and facilitate for others, as opposed to creating opportunities for himself, but his sheer presence means that other players are losing the opportunity to shine. Marcus Morris, Marcus Smart, Terry Rozier, and Aron Baynes are all averaging fewer minutes than Hayward, and all four were significant components in the Celtics eastern conference finals bid just six months ago. This is a perfect example of the butterfly effect in basketball. When players like Rozier, Smart, and Jaylen Brown suddenly find themselves fighting for minutes, they tend to overcompensate in the minutes they do play—hence why their shot selections have seemed increasingly more hurried and poor as the season has progressed. Elsewhere, with a deep rotation of guards and wings, the prevalence of size begins to diminish—hence why Baynes has seen a sharp decline in minutes from his role in the playoffs, from 20.5 to 14.7 minutes per game. Stevens has always overachieved with the talent he’s been dealt, whether it was in his collegiate career with Butler or his years with past Celtics teams. However, finally, he has all of the resources at his disposal to win the eastern conference, and no LeBron James to stop him in spectacular fashion. It would be easy to say that through their overwhelming talent alone, the Celtics can weather the storm and press on. However, with a record sitting just above .500, and a slew of challenges ahead, it’s paramount that the Celtics strike early, and clinch home-court advantage before the playoffs begin. Stevens recent decision to start Irving, Smart, Tatum, Morris, and Horford against the Pelicans was certainly a step in the right direction—harkening back to the days of Isaiah Thomas when star players were surrounded by ancillary talent and not a collection of names. And, the results were undeniable, with a 124-107 win in New Orleans to cap off a short road trip. I'm a young college student who just wants to share his love for the game with the world.